DANANG, Vietnam (Viet Nam News/ANN) - Stonemasons living in Non Nuoc village at the foot of the Marble Mountains are striving to keep their ancient craft alive. -Tran Van Xuat, 54, turned his stone shop into a small shopping centre and stone craft experience site during the tourism boom of the early 1990s. The shop – in between Hoi An and Da Nang – is a workplace of 60 stone sculptors and is visited by 300 tourists each day. “Tourism has helped the stone trade survive. Stone carvers can still earn from their craft, even if it’s less than 20 years ago. Young people are gradually seeking fewer jobs in manual labour, especially tough skill-based carving,” Xuat said. The artisan said stone mortars, bracelets and statues were the most popular products, but craftsmen made many items, including garden decorations and stone furniture. He said carvers at his shop could earn from VND6 million (US$270) to VND10 million ($450) each month. Xuat, however, was concerned the trade faces competition from cheap, mass-produced products. Local craftsman Ho Van Quy, 47, who spent 25 years in the trade, said he could not leave his job. “I was born to work with stone. My fingers can feel the ‘heartbeat’ of stone when I touch the rocks,” Quy said. “A new sculptor could be working with rock in five or six years. Buddha statues are always the toughest as they a spiritual touch to capture the facial features,” Quy explained. Chief of Non Nuoc Village, Nguyen Viet Minh, said the craft faces tough competitions from mass-produced souvenirs. “We struggle to cover production costs in comparison with industrial producers from China, while our designs are limited,” Minh said. Now 75, he has spent 60 years working with stone. 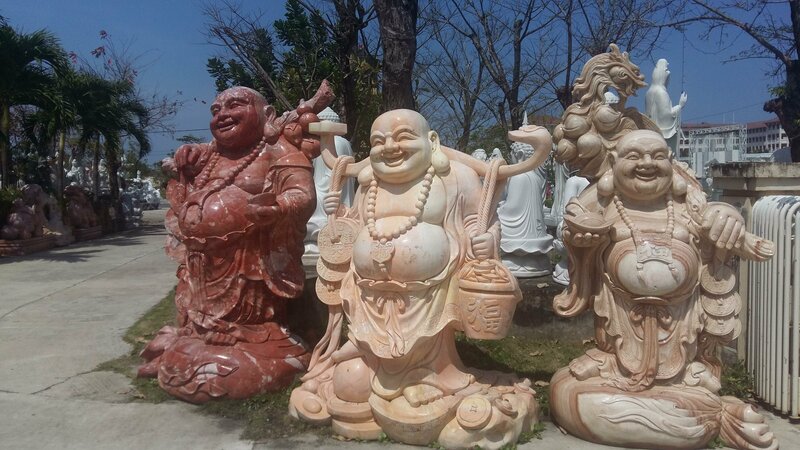 “Buddha statues and garden decorations for pagodas and temples are a good way to keep the trade going,” Minh said. Minh said tourists consume 70 per cent of the products from the village, and only sustainable growth of tourism could help preserve the 400-year-old craft. "There needs to be a plan to attract visitors who want to explore the history of our trade and village," Minh speculated. Despite the disadvantages, the village with more than 500 shops still generates VND200 billion ($8.8 million) in revenue per year. The village, which was promoted as an intangible heritage in 2014, enjoyed more cultural value when the Marble Mountains were recognised as a National Special Heritage in 2018. The site is a popular destination in Da Nang with nearly 2 million tourists in 2018 – 27 per cent of the total 7.6 million who visited the city. The Marble Mountains also hosts the annual Quan The Am (Avalokitesvara Bodhisattva) Festival – one of the 15 largest events in Viet Nam – with the participation of 10,000 visitors over three days every lunar February. Vice chief of the district, Huynh Cu, said the district had allocated a 35ha area as a centre for stone sculpture and shopping in the Master Plan in 2025. He said the centre will include stone workshops and a work space. The area would be a significant attraction on the Da Nang-Hoi An journey. Director of the Da Nang Sculpture Foundation – a non-governmental organisation – Phan Quynh Huong, said the foundation acted as a non-profit vocational training centre for young sculptors to ensure the sustainable preservation of the old trade. The foundation, which was started by Norwegian sculptor Oyvin Storbaekken after a visit to the village in 2001, and the Norwegian government agreed to fund the project in 2003. The project has helped train local stone carvers in modern techniques with international carving standards. “Local craftsmen practise their family trade, and stone products were limited with simple designs. They lacked education from college,” Huong said. “The six-year project, which ended in 2006, helped build up a mind-set for local carvers to create stone sculptures,” she said. The foundation hosts sculptors from European countries as part of workshops for local craftspeople. Local craftsman Nguyen Thanh Tuu, 38, said he had improved his skills after attending a co-working space with international sculptors at the foundation. “It’s progressive. We could learn skills and knowledge from European sculptors to create unique stone sculptures,” Tuu said. Tuu started up his own stone shop in the village after he left the foundation a few years ago. Chong Fahcheong, a sculptor from Singapore, often comes to the foundation to work on stone sculptures for his own exhibition. “I visit the foundation with different sculptures. I have introduced different exhibitions of stone sculptures at the National University of Singapore. All sculptures were made by craftsmen at the foundation,” Chong said. “I bring tiny models to Da Nang and local carvers help me make big stone sculptures. Local carvers are skilled and they can understand my aspirations,” he said. Artisan Xuat said he had been co-operating with partners from Brazil and South Korea over the past seven years. “It’s also a positive way to help preserve the craft and lives of local carvers. The trade can be preserved when local people live well. Seeking new markets and co-operation opportunities helps ensure the prolonged existence of traditional crafts.